The members of Pinoymiler Facebook group have voted and chosen their favourite moment at the athletics competition at the 2012 Philippine National Games. Voting took place over a week and ended on June 15. Two long years of trying and failure finally came to a happy ending for the young triple jumper, Felyn Dolloso, when she finally fulfilled her dreams of breaking the 12 year old national junior record in said event, with a leap of 12.55m. 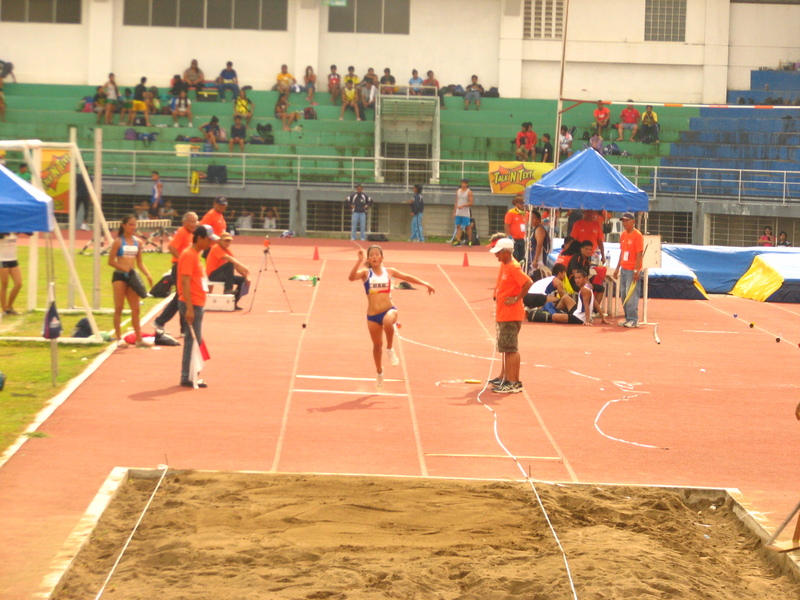 Dolloso, who hails from Bacolod, and originally was trained first by grass-roots coach RV Alvarez, first noticed by PATAFA when she shattered the Palarong Pambansa record in 2010, with a leap of 12.35m. From there, it would be a journey of tears and hope for her, which eventually led to the performance at the National Games. Dolloso’s performance quickly declined with the move to DLSU-Taft and the big city. She failed to improve on her PB in 2011, plagued by continued injuries and adaptation to the new training regime. Her narrow 1cm win in the triple jump at the 2011 UAAP was perhaps a glimmer of hope in those dark times or a sign that the rest of the jumping world was closing in. Things didn’t get any easier for her after that, a failed subject ruled her out of defending her uaap title and disappointment continued when she was removed from the training pool. When most athletes in the same situation would just give up. Dolloso took the only option she knew and that was to ‘find a way’. That came with a very wise career move where she started training under a very experienced veteran athlete SEA Games womens long jump record holder Marestella Torres. (12.43m in 1999 was Torres jr record, which Felyn later eclipsed). A 12.00m jump in Laguna showed a return to form. During the PNG though the obstacles put up against Felyn didn’t end there. Competing for Hypersports, she had been entered in the junior division held on a Sunday. But due to a schedule change would be unable to participate as she had to leave to attend classes at the end of Day two. Hypersports management had not realized the sudden change in schedule and was focussed on winning the Girls overall title (which they did with just five girls). Felyn had prior thought she was entered in the seniors so she was disqualified from the event by the chief technical official. Who advised she could play in juniors on Day four, but later more headaches were caused when that decision was reversed. After an appeal, Felyn was finally allowed to participate in the Junior division, overcoming the stress, not only winning the gold but breaking the junior record. Felyn is currently 4th in the all time women’s triple jump, but is the youngest (18) among the four when they established their respective marks. Ahead of her are Marestella Torres and Kaye Santos who were both 22 when they achieve their 12.67m and 12.62m respectively. Incidentally, Katherine Kaye Santos registered her 12.62m in the same PNG competitions. Logically, the next goal for Felyn is to up the all-time leader board and to reach the very difficult SEA Games standard of 13.64m (bronze last sea games). Felyn will be one of the few athletes Hypersports will let compete in the Seniors at the National Open in October as she has proven everything she needs to in the junior division. This entry was posted in 10 PNG and tagged 2010 Palarong Pambansa, DLSU, felyn dolloso, marestella torres, National Record, palarong pambansa, PATAFA, PNG, RV Alvarez, UAAP. Bookmark the permalink. hey andrew , i think you forgot to put my record on this,i’ve got 12.23 m during my college years. Riezel we checked the official results and this is a valid performance. I will include this performance in my 2011 Annual of Phi Athletics which will be available for purchase shortly. Thanks Riezel i have updated this now. I’ve always been puzzled why our triple jumpers are lagging so much in SEA level, built wise there is not much of a difference. My hunch is two few athletes are competing in this event; and then, I’ve also thought maybe it is technique. Perhaps we need to hire an international triple jump expert to improve philippine standards drastically. I’m sure Dolloso and Santos talents will be greatly enhanced. Not that they are already benefiting from their talented coaches now. Balauitan and Torres seem to be doing quite well as triple jump coaches pushing Dolloso and Santos always past the 12m. But making these talented girls big internationally requires an expertise of an intl triple jump coach. Just a suggestion.